Fern Langlois has been hired as the new food service manager at Central Maine Community College (CMCC). Langlois comes to the college with a strong background in food service, having worked for Sysco Foods for 23 years. More recently, he was the food service manager at Lewiston High School. Langlois earned his degree in culinary arts from the Culinary Institute of America in Hyde Park, NY. He lives in his hometown of Sabattus. 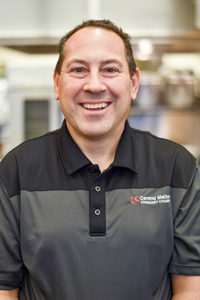 Langlois is working with senior manager Bob Daigle in overseeing the entire food service operation at CMCC, including the campus dining commons. The dining commons provides students, faculty and staff with entrees, made-to-order wraps, a full salad bar, short-order service, snacks and beverages.